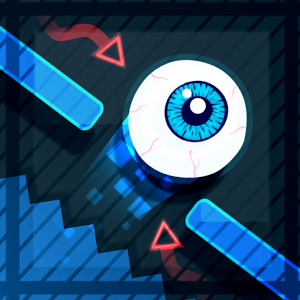 Avoid obstacles on the way: Cybers, portals, spikes and many more to test your skills. There are more than 20+ levels and modes with exciting and tricky obstacles. blocks that will crush you, cyber swarms that follow and attack you, sharp spikes, even portals that will teleport you and many more awesome obstacles. You can connect with other players and compete against them in enemy frenzy mode, the one player that survives logner from cybers will win. Cybers will emerge from the top for every few seconds and they will follow each player. Try to survive longer than the other players and you will be rewarded. Good tip: try to bump into other players, so that they bounce into cyber enemies! As you play collect coins on the way, and spend them on new players that you can play with. Eye, ninja, zombie, mars, soccer ball, donut, ghost are some of the many players that are available to unlock. Click in the direction in which you want the ball to jump. You will need to think sometimes in which way you will jump, since some moves will have different outcomes, harder or easier. There are portal obstacles. In order to proceed, you will need to go into one side of the portal, that will teleport you to the other side. Red Spikes are waiting for you on the side of the screen, and they will attack when you get too close to them. Spikes will charge at the least moment that you expect, they will be lurking from the side of the screen, and attack you when you come too close to them, beware. There are many other types of blocks that won't be easy to avoid, moving obstacles and many more.